Wargroove, Chucklefish’s answer to the 3DS classic Advance Wars, will support cross-platform play between PC, Nintendo Switch, and Xbox One when it launches February 1. The developers confirmed cross-platform support would be included at launch in a tweet this week. “Sometimes your friends aren’t in the same faction as you, and that’s okay,” they riffed. 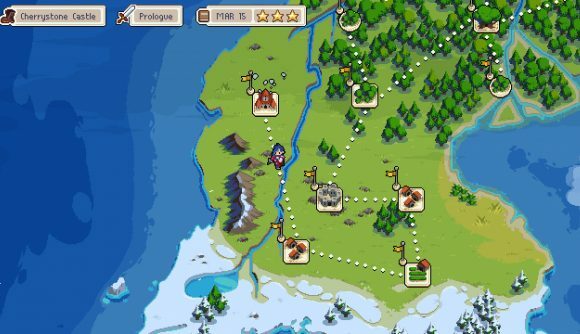 Naturally, this means you’ll be able to play Wargroove online in head-to-head battles, but Chucklefish is also supporting online co-op and asynchronous modes, something like a classic Play By Email system. And you’ll be able to play alongside or against your Switch- or Xbox-equipped friends. Unfortunately, cross-platform play won’t be available for PlayStation 4, at least at launch (the PlayStation version comes out later, on an as-yet-unannounced date). There’s reason to be slightly hopeful, though, since Sony has indicated that it’s opening cross-platform support on the PlayStation. The good news, though, is that Wargroove also supports local co-op, and it allows you to completely customize the ruleset for all your multiplayer battles. The more we learn about Wargroove, the more excited we get about it – last week, we learned about how powerful Wargroove’s battle and campaign editor are, and this week we got a shiny new anime-inspired trailer. Also, one of the game’s playable commanders is a dog. All this is on top of the 12 campaigns that will be included with the game at launch – not bad at all. Wargroove launches Friday, and you’ll be able to find it on Steam. And hey, you’ll be able to play with all your Switch-toting comrades when it does. For those of us with fond memories of Advance Wars, this is all sounding pretty good.